By Regina Villiers. Originally published November 24, 1999 in The Suburban Life, added November 17, 2018. A faded clue to the past shows the old Wehrmann house in the background. 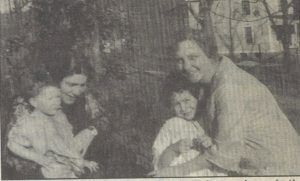 Evelyn Krimmer believes the woman and child on the left are Elsie Wehrmann and son, Charles. The woman and child on the right remain a mystery. On a sun-drenched, mid-September day, cousins Evelyn Krimmer and June Schrichten met to reminisce about their grandparents’ farm. As they sat at a picnic table with Evelyn’s scrapbook, family pictures and family research spread out before them, they talked about their happy childhood days spent at their grandparents’ home. Their grandparents were Henry and Elizabeth Wehrmann. Henry was born in Germany in 1866 and came to this country when he was 14. Elizabeth’s family also came here from Germany. Henry and Elizabeth bought a farm in the Kenwood Road area. The farm had fruit orchards and many greenhouses. It extended back along Shawnee Road to Camargo Road. The Wehrmanns had truck farms and raised and sold vegetables. They were hard-working people, Evelyn says, and she remembers how her grandmother would go on weekends to downtown Cincinnati to sell produce and whatever was in season at the Sixth Street Market. She would leave Madeira Friday evening with a horse-drawn wagon loaded with produce. She would go through Madisonville at dusk, going down Madison Road. She would spend all day Saturday selling produce and then would return home in the wagon. “And she did all this while having 12 children,” Evelyn said. The Wehrmanns’ house was located near Shawnee Run and Camargo roads. Evelyn and June both have happy memories of the house. After Henry and Elizabeth bought the property, Henry couldn’t forget the picnic areas he knew back in Germany, where the people enjoyed good food, music and dancing. So, he decided to start such a picnic area of his own, right there on his own farm in Madeira. He opened up the Valley View Picnic Grounds, which ran along Camargo Road. This became a prosperous business for the Wehrmanns. They rented it out to private parties and to various groups, churches and businesses, such as U.S. Playing Card. There was a parking lot in front, with an entrance gate that charged a fee. Then came the concession stands with soft drinks, food, popcorn and beer. There was a huge dance hall. Evelyn said it contained the first nickelodeon she had ever seen. The popular song of the day was “Beer Barrel Polka” and you could play it for a nickel. And Henry brought in slot machines. It was a swinging place. The area contained a pony track where kids could ride ponies. It was located so as to be an attraction, up front, visible from the entrance, to catch the eye of kids. On the lower level, near the creek on Camargo Road, a flat area of land made a playfield where baseball games, three-legged races, sack races and potato races took place. Evelyn, June and their cousins worked around the park when they were children. The days after parties and events were the most fun for them, because they were “treasure hunt” days. They would find coins and trinkets lost by partygoers. Gus Uebel lived then, with his family, on Camargo Road, up from the picnic grounds. Gus still lives in Madeira in his home on Juler Avenue. Now 93, with a memory as keen as your grandpa’s freshly stropped razor, he remembers the Wehrmann family, especially the children, and he remembers the picnic grounds. He remembers the music and sounds from the parties. He does remember crashing a big party there one weekend. A Uebel family pig escaped, and Gus went in pursuit of it. “We weren’t about to lose that pig,” he said. “It was to be fattened and butchered for our winter’s meat. So Gus took of after the on-the-lam pig. The squealing porker headed straight for the picnic grounds and ran amok among the screaming picnickers, with Gus in hot pursuit. Before catching the pig that day, Gus got an intimate view of the inner world of the picnic grounds. The old house stood for a long time. Then it was bought, and the house was remodeled by Ken and Nancy Cummings. But now, even the house is gone. It was torn down, and a new one stands in its place. All that’s left are a few pictures and a scrapbook Evelyn has put together. But maybe the spirits of Henry and Elizabeth do still linger about the land they once owned and loved. Who knows? 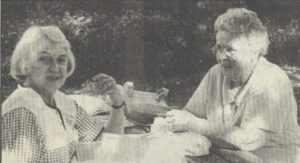 Evelyn Krimmer and cousin June Schrichten spend a vibrant September afternoon reminiscing about their childhood and the home of their grandparents, Henry and Elizabeth Wehrmann.